Not having an all-new product in the local market has not stopped Isuzu Philippines from injecting excitement in its current lineup. The Japanese carmaker recently launched the new D-Max Radikal edition package aimed at making the pickup truck more attractive to motorists who are not afraid to test their vehicles on different terrains. The Radikal-edition package includes a bed liner, scuff plates, under-grille cover, taillamp guard, and interior and keyhole illumination exclusively for the Boondock 4x4 and the 4x4 LS Isuzu D-Max variants. The Boondock also gets a multifunction clinometer and Euro-design rollbars while the 4x4 LS comes with a navigation-ready 2-DIN audio/video head unit with a seven-inch touchscreen display, an iPod and Bluetooth connectivity, and a 5.1 digital surround sound system. The Radikal package for the standard D-Max 4x4 LT includes sporty over-fenders, limited slip differential, and a bed liner for limited units. The special edition package is also available for 4x2 units. 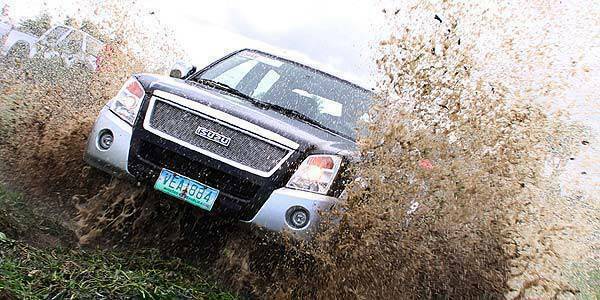 Isuzu Philippines has scheduled test drives hosted by its provincial dealerships until August (click here to view the complete schedule). Interested motorists can subject the Isuzu D-Max’s off-road prowess to various tests like rock crawl, elephant holes, cross axle challenge, and hill ascent recovery (view gallery below to see the Isuzu D-Max Radikal in action). Click here to check out the entire Isuzu D-Max lineup.